You are here: Home / Guitar Lesson Blog / Guitar Gear / Strings Going Out of Tune After a String Change? Face the fretboard, and tuck your index and middle finger below any given string at around fret 20. 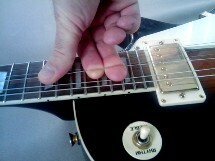 Now place your thumb onto the string, holding it against the fretboard. With your thumb holding the string against the fretboard, pull upwards with your index and middle finger, so you are stretching the string. Repeat this higher up on the same string in 2 more positions (around fret 13 and fret 6). This will cause your string to go out of tune, since you are stretching it. Now tune the string to pitch, and repeat the process on the SAME string, until you don't really need to retune it anymore. Make sure that when you tug on the string, you do it gently, don't want to break it. Through the above, you will manually stretch the string, and won't have to wait until it stretches by itself. You need to do this with every string whenever you change strings, this will save you the hassle of having to retune it all the time after changing strings. If it still goes out of tune too often afterwards, you'll probably have an issue with your tuner or tuning pegs, or perhaps you didn't lock the string into position effectively, causing it to loosen around the peg, but the above method will solve the problem of out of tune strings 90% of the time. Not long, it only takes a couple of seconds per string. Just go over the length of the string stretching it evenly, and thats pretty much it. Thanks for the tip. How long should I hold the manual stretch for?